Boys will be boys! Sometimes, I think our pantry (which is really our "catch all storage room" of the house) looks more like an armoury! We store Nerf dart guns, Nerf water guns, Star Wars light sabers, and Nerf swords, axes and shields in there. Having three nephews, my husband acts as their weapons master and train them in all combat arts! I made this mini album for my husband. I came down to the kitchen to make a tea one afternoon and could hear the battle cries from the back yard. So, I went out on the deck and snapped some shots. (These are from 2011). Since my husband was so good to me to help me outfit my new paper studio layout over the Christmas holidays, I decided it was about time I finished this project! You can jump to this all boy mini album VIDEO on my Vimeo channel. 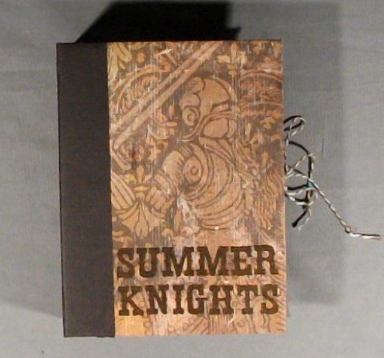 I made it with chipboard covers and black cardstock pages. The pocket pages are actually more like sleeves. In one side, I inserted the hinge. In the other side, I have pull out page with a flap. I prefer to make my pull outs at the side so that the photos on the inside are protected from dust. I am still experimenting with mini albums a little. Thus far, I have reinforced the hinges and all folds with Tyvek, however this makes the folds thicker and therefore stiffer. I've started another album where the hinges are Tyvek only - no cardstock. (It might take me another 2 years to finish the next album though!) 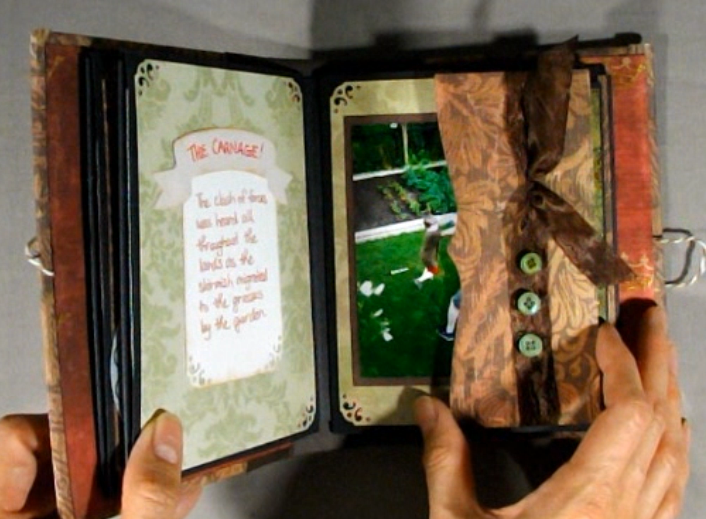 After that, I might try an album where the hinges are ribbon only. Lots of ideas, so little time!